Have you ever noticed the leaves of your plants looking a bit more twisted than they should be and down near the base of the leaves there’s this white powder stuff that looks ominous. This problem is very common on indoor plants and chances are, when you bought the plant home, the pest was already there but in very small numbers.Mealybugs hide in the crevices of the leaves of your plants so that by the time you notice something’s wrong, they’ve done a lot of damage. Let’s find out more about what it is and what to do. 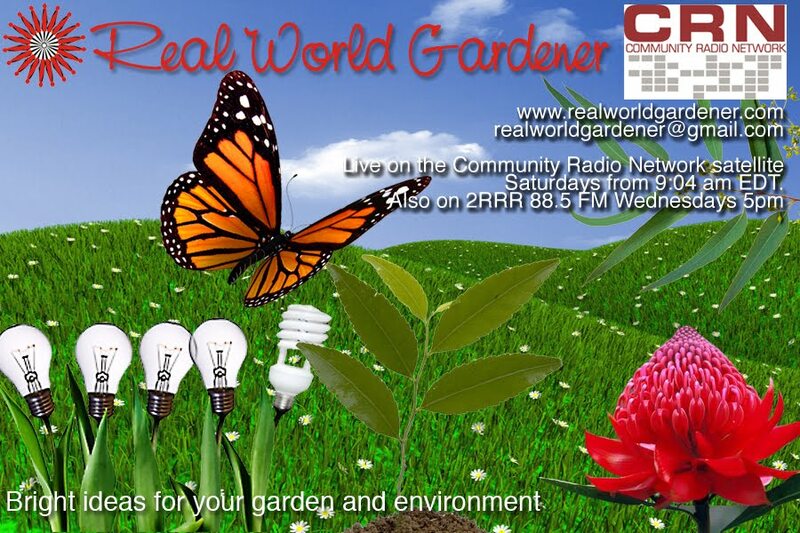 I'm talking with Steve Falcioni, general manager of eco-organic garden. Sometimes you can take that indoor plant outside so natural predators can take care of the pest problem. Mealybugs love nothing more than sucking sap from leaves and stems! They are only 0.5 cm in size, oval in shape, pinkish in colour but what you see is the white waxy filament covering. This will always be the female mealybug. 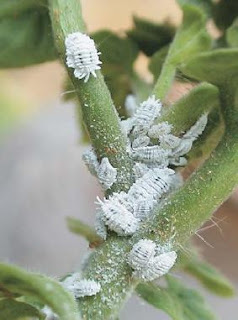 The male mealybug is very tiny at around 1mm. Exuding honeydew is a special talent of mealybugs, which encourages sooty mould. They also release toxic saliva that can seriously damage plants. 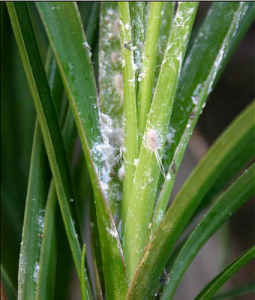 Mealybugs really love Citrus plants, orchids, ferns, loads of ornamental plants such as Agapanthus and shade houses. They like warm and humid weather… it just makes then breed! Oh, and they love ants, because the ants farm the mealybugs for their honeydew. Ever heard of Ceylon spinach, Indian spinach, vine spinach, and Malabar nightshade? Doesn’t matter if you haven’t because you’re about to find out. The one we’re focussing on is the red stemmed version or Scientifically it’s Basella alba 'Rubra'. Malabar or Climbing Spinach originates in India but is also found naturally in Africa and other parts of Southeast Asia. Did you know that an extract of the fruits of the red stemmed version of -Basella alba ‘Rubra’, have been used for hundreds of years as deep red dye for official seals and a natural form of rouge in cosmetics? Why it’s called Malabar spinach because it was first discovered in the Malabar region-on the south-west coast of India in dense tropical jungles, along coconut and pepper plantations. Malabar spinach first made its way from India to Europe in 1688 when it was introduced into Holland by the Dutch governor of Malabar, Adrian Moens. The juice from the berries is so intensely purple that it puts beet juice to shame. A bit like Dianella berries I think. In some countries, this juice is used as a natural food colorant for agar (vegetable "gelatine") dishes, sweets, and pastries. So what does this Malabar Spinach look like? For lovers of all things romantic in the garden, you can’t go past a plant with heart shaped leaves even if you want to eat it. Malabar spinach is a climbing plant not even related to true spinach (Spinacia oleracea) but grows large succulent heart shaped leaves that are a bit like spinach in taste. The leaves are quite a bit more waxy to my way of thinking. I would describe it as crunchy and juicy when raw. The taste is slightly peppery with a bit of a citrusy flavour with hints of earthy spinach to it. It’s not bad to eat, some say even delicious to eat, but I can’t say I use it a lot in cooking. More of an attraction in the garden with the leaves and the purple flowers followed by black berries. The upside is that if you like your Spinach, this one’s is easy to grow and is much better suited for summer growing than Spinach itself. When your lettuce and other salad greens are wilting, because Malabar spinach is a twining succulent (stores water in the leaves and stems), you’ll have plenty of greens for your salad. Malabar spinach does best in warm, tropical areas, where it can easily grow a 10cm per day. In the tropics, Malabar spinach can grow 2-3 metres or eight to ten feet tall and wide and has small white-tinged pink to purple flowers in the leaf axils. This plant isn’t frost tolerant and in temperate areas doesn’t grow anywhere near as tall as in tropical areas. In cool temperate districts, I would treat this plant as an annual, but yes you can grow it too! If you’ve grown this plant before, you would know that the plant seems to die down in winter then re-shoots again in late spring. So don’t go thinking you’ve killed it at the end of autumn. Straight species Malabar spinach has yellowish stems and green leaves and looks nice enough, but it's the red-stemmed cultivar 'Rubra' that really stands out. Red and green are opposites on the colour wheel and the combined effect is always a bit dramatic. The red veins in the leaves make it more so. When the flowers are fertilised, small, attractive, single-seeded purple berries will grow. Basella alba grows best a humus-rich, sandy loam in full sun but will produce larger juicier leaves if grown in partial shade.. It grows easily from seed that has been sown in situ or you can start it off in a punnet. Simply dry the entire fruit and use it for planting the following year. Just make sure you store it dry in maybe a paper envelope. I had saved some seed, but there must’ve been some moisture in the jar because they had become all mouldy. The red-stemmed cultivar of Malabar spinach comes true from seed. Luckily, when I was renovating my veggie bed, I noticed quite a few small seedlings in one corner of it that looked like-in fact were seedlings of Malabar Spinach. I remember from last year that once it starts to take off in the ground, it can grow about 30cm in a week! In a pot , it’s much more tame. TIP: When you have a plant in season, tip cuttings will root readily in water so you can give other members of your garden club or other friends some plants. Use any style of plant support you like: poles, teepees, chain-link fencing—I’m growing it up a metal spiral, but I think it’s going to outgrow that real soon. Whoops! Malabar spinach is insect and disease resistant. Where do you get it? Plenty of those big box stores that have garden centres have it as well as your local garden centre or plant nursery. The succulent leaves and stem tips are rich in vitamins A and C and are a good source of iron and calcium. They may be eaten raw in salads, boiled, steamed, stir-fried, or added to soups, stews, tofu dishes, and curries. Or you can use them as a filling for quiche, omelets, or even a frittata! Since red-stemmed Malabar spinach can lose a lot of its red colour when cooked, perhaps it is best in raw dishes. A great way to use it is to plant it thickly in pots in spring, and when it’s growth takes off, pick the young shoots off daily for stir-fries & omelettes. Eventually it will get away from you by climbing or sprawling, but usually can be contained for a couple of months this way. The shoots are delicious & tender! This month, Louise and I have been undertaking a trip to a few of these gardens for inspiration. Hidcote in the Cotswalds in England which has a famous Red border , two long wide borders flanking a stretch of lawn – backdrop of tall green clipped hedge behind each border. The Hidcote borders have red foliage and red flower plants combined with green. Structure and height is given by small trees – red leaf Japanese Maples – lovely shape and delicate leaf texture. In Australia Acer palmatum Osakazuki has brilliant autumn colour – to around 4m tall. Acer palmatum Sango Kaku (coral bark maple) know for bright red stems so attractive when not in leaf. But it was a section that could easily be re-created in any garden, even a native garden. What did you think of the plant choices? Are you inspired to plant out a few more red plants-red leaved plants that is in your garden. Not bright red, but the deep reds of maples and some of the strappy leaved plants. Only growing to anywhere between 1 and 5 metres depending on the type you get, it’s a tree that should be grown more in the home garden. Tart, citrusy and incredibly juicy, pomegranate seeds have suddenly become hip again, and have appeared in dishes and desserts from Masterchef to 5 star restaurants. They grow in most climates throughout Australia, but don’t like extreme cold. 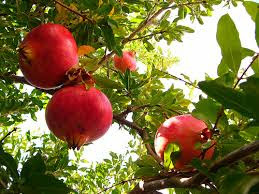 Pomegranates have attractive glossy green leaves, and like to be pruned - remove the current year’s growth in late winter to promote dense growth. The plants produce reddish to light orange, crinkly 8-petalled flowers from late spring to late summer. These are followed by the most extraordinary coloured and shaped fruit which look like a cricket ball of a certain colour and should start appearing from the third to fifth year of growth. Although the Pomegranate is drought tolerant, to get good sized fruit, you need to water it as much as you would a Citrus tree in summer. 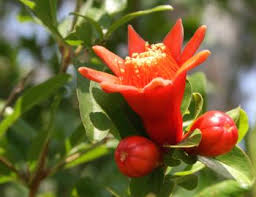 Pomegranates can be propagated from seed sown in spring or from cuttings taken between spring and autumn. In the autumn split open the fruit to find rows of red seeds, eat the red flesh surrounding these, but spit the seeds out. It's a little bit complicated, but the fruit is truly delicious. How to eat a pomegranate ! 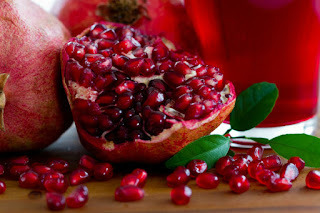 To get those delicious arils out of the pomegranate here’s what you do. First cut the pomegranate in half. Holding it seeds-down over a bowl, massage and squeeze the shell a bit with your fingers, to soften it and loosen the arils. Whack the back of it with a rolling pin or a wooden spoon, and they’ll fall straight out into the bowl. Keep squeezing and whacking until the shell is empty. Watch your fingers! Pick out any white bits of pith you can see, and you're good to go.